LANSDOWNE, Va. – America’s top colleges and universities should institute an admissions preference for low-income students because such students – even when they are high-achievers academically – now face unjustified barriers and make up a mere 3 percent of enrollment at the elite schools, according to a landmark report issued today by the Jack Kent Cooke Foundation. The Cooke Foundation found that such a “poverty preference” for admissions to selective higher education institutions, akin to existing preferences for athletes and the children of alumni, would create a more level playing field for disadvantaged students. 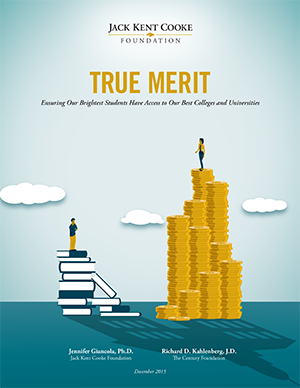 The Cooke Foundation report – titled “True Merit: Ensuring Our Brightest Students Have Access to Our Best Colleges and Universities” – shows dramatic differences between enrollment rates at the most selective schools for students from families with the highest and lowest incomes. It highlights the major challenges low-income, high-achieving students face when seeking admission to these colleges and universities. Perhaps the most significant new finding of the report is that the vast majority of students in America’s most competitive institutions of higher education – 72 percent – come from the wealthiest 25 percent of the U.S. population. In sharp contrast, only 3 percent of students in the most selective schools come from the 25 percent of families with the lowest incomes. The report is the first comprehensive analysis conducted on the postsecondary admissions process as it affects high-achieving, low-income applicants. The lucky few low-income students who get into top colleges and universities have proven that they can handle the most challenging academic work because 92 percent graduate and do well academically, the report found. Significantly, the report concludes that preferential college admissions for qualified low-income students could result in as much or more racial and ethnic diversity than is being achieved by current race-based affirmative action policies. Only 23 percent of high-achieving, low-income students even apply to a selective school, compared with 48 percent of high-achieving, high-income students. More than 80 percent of the nation’s most selective institutions give a preference to children of alumni, who are typically wealthy. Recruited athletes are as much as four times as likely to be admitted as other similarly qualified students but, once admitted, dramatically underperform compared to others with similar academic credentials. High-achieving, low-income students are only half as likely as wealthier students to take ACT/ SAT prep courses, even though it is clearly documented that the courses raise scores. The report was authored by Jennifer Giancola, Ph.D., director of research at the Jack Kent Cooke Foundation; and Richard D. Kahlenberg, J.D., senior fellow at The Century Foundation.